See www.ngartsite.com for an overview of my art endeavors over the years. My facebook with a page titled: Nancy Griswold - Fine Artist, please 'like' for recent work and postings. I teach/mentor oil painting and pursue making art. 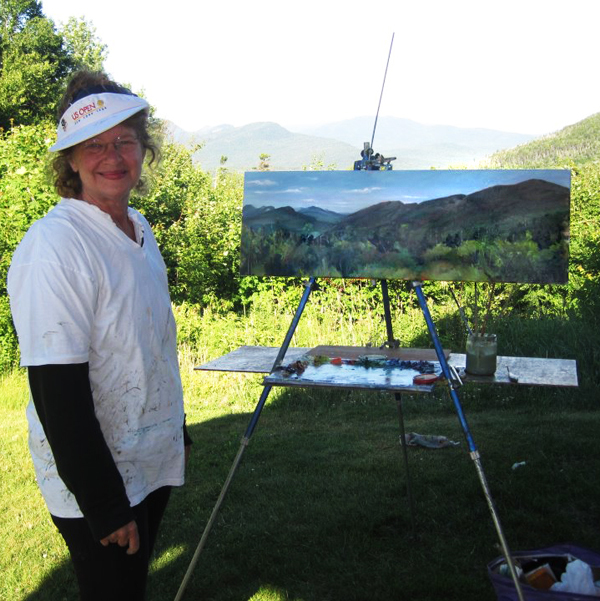 My oil paintings encompass genres of New England Landscape, Still Life and Native American. Born in Hartford, Connecticut, I acquired my BFA at Massachusetts College of Art and Design and also studied the arts at Bennington College, Hartford Art School, Northeastern University, Decordova Museum Art School and studied under other painters. I spent many early years in the Boston area studying and working in the arts. Being a diversified and multi-talented artist, my employment has encompassed fields of fine arts, photography, teaching, oil painting, design and illustration through various towns in New England. I now reside in Upper Valley, Vermont. I can see the White Mountains from my yard and the Connecticut River Valley. The best of both worlds for more outdoor painting as I face the rolling hills of Vermont by turning my head in the other direction. This is amazing landscape and subject matter for an oil painter and artist. I believe that my art is a product of vision, desire and discovery; and that it's growth is dependent on challenges, courage and constant vigilance. I love to share my work and collaborate, but PLEASE ask my permission for usage. My art is Visual Art Copyrighted. I am now on facebook with a page titled: Nancy Griswold - Fine Artist, please check in for recent work and postings. Originals are for sale at my home website: www.ngartsite.com. I have sold my artworks and reproductions of my works Nationwide and Internationally. See ALL six new slide shows of my artworks. Be sure to CLICK FULL screen icon in bottom right of the show. This year I will be Oil Painting the northern New England and working on the Print Renditions. All of my art is now available Note Cards, High Quality Prints & Framed Prints. Cards can be imprinted free. Just click on any image to order.. Email me if your interested in having your home or business rendered in my new print rendition technique or an oil painting created. Be sure to see all the many galleries of my work: New England Landscape Oil Paintings, Still Life Oil Paintings, Native American Oil Paintings, the Mural; Rock Gods & Nature Deities, Flower Photography, Nature and Scenic Photography, Nature Mandalas and Greeting Card Designs! More of my work can be found on http://www.ngartsite.com/ AND http://nancy-griswold.artistwebsites.com/ AND A video on http://www.youtube.com titled "Artworks of Nancy Griswold"
I believe that my art is a product of vision, desire and discovery; and that it's growth is dependent on challenges, courage and constant vigilance. I invite you to view my website at www.ngartsite.com to explore the many galleries of work and class schedule. I am now on facebook with a page titled: Nancy Griswold - Fine Artist. Please visit for recent postings. If you see a different image in my gallery than what you see here on Fine Art America website and you would like a print, simply contact me and I will prepare it for you so that you can order a card or print from this website.